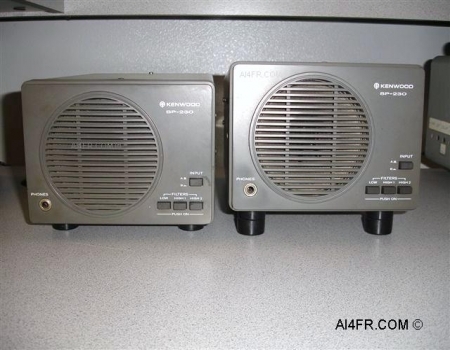 This Kenwood SP-230 is an external speaker which matches up very nicely to many of the Kenwood series of radios such as the TS-530 and TS-820 featured else where on this website. 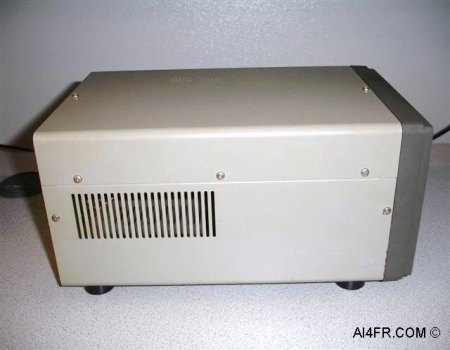 The frequency response of this speaker is from 100Hz to 5kHz. 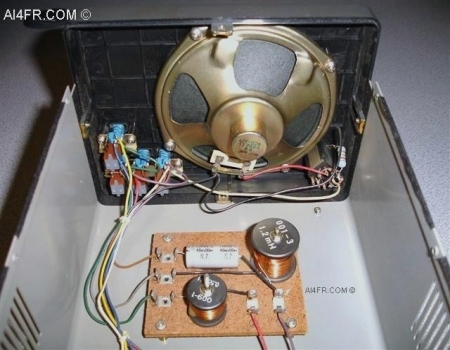 The internal speaker has an impedance of 8 ohms and a maximum input of 2 watts. Another feature that makes this speaker so appealing is that it offers filtration in 3 different filter settings. The cut off frequency response is as follows, in the low setting it is 400 Hz, in the High 1 position it is 3 kHz, in the High 2 it is 1.5 kHz and when the High 1 + High 2 settings are selected it is 1 kHz. 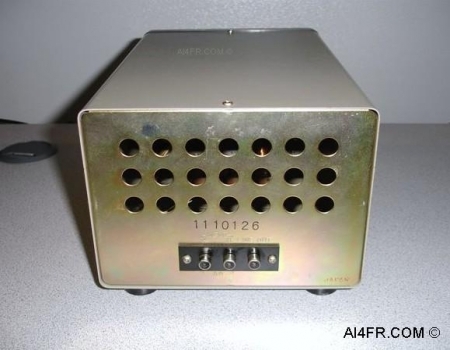 There is also an A/B switch on the front which will allow the operator to select between different inputs such as using this speaker with two different radios. Another nice feature of this speaker is that it offers a 1/4" headphone plug right on the front for quick and easy access. As well a 1/4" headphone plug on the rear but when the rear one is used the SP-230 speaker is not muted. This speaker measures in at 7 1/16" wide by 5 1/4" high by 11 5/16" deep and weighs in at 4.0 pounds. When these speakers are shipped, they are supplied with extender feet to match those of the Kenwood radios. In the picture on the left I have set up a side by side comparison of the SP-230. The SP-230 on the right has the extender feet installed while the one on the left does not. The photograph on the right is of the back of the SP-230. The photograph on the left is of the side of the SP-230. The acoustic air vent seen on the side of the cabinet are factory installed by Kenwood and another sent of identical vents is located on the other side. The photograph on the right is a view of this item with the top of the case removed. Here we can see yet another set of acoustic air vents that are located on the bottom of the cabinet. The picture on the left is a close up view with the top case removed looking from the back towards the front. 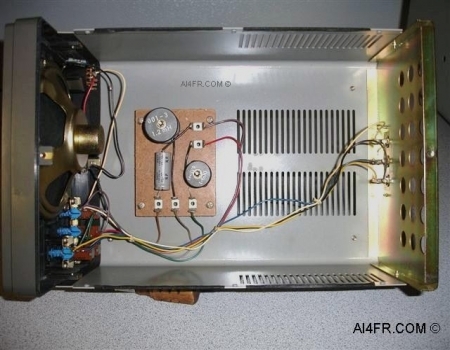 Here we can see the large 8 ohm speaker, switches and internal components. The picture on the right is a close up of the internal board with components that allows this item to have filtration. Since I had the cover off I thought I would test the components to see how close they were to the rated specifications using a Sencore LC 75 LCR meter. As expected, all three components were spot on. The Sencore LC 75 is a very valuable tool I use on what seems like a daily basis. 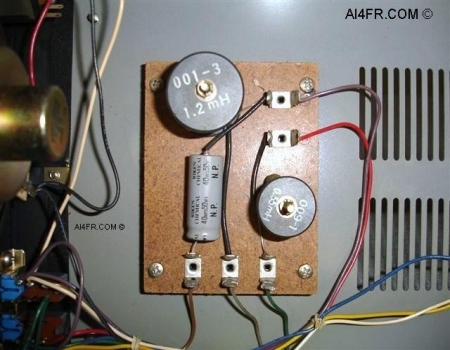 It can preform numerous checks on capacitors as well as coils and chokes.